When I've shared blog posts about skincare in the past, I've pretty much always mentioned products I've picked up from the drugstore. I've definitely found some amazing products which I've continued to repurchase time and time again, that come with a super affordable price tag. This allows me to chop and change the products I use depending on my current skin needs. Now that I've developed a skincare routine that works for my skin, I've realised how important it is to include serums and the benefit they have to my skin. If you didn't know, facial serums have a really lightweight consistency that can penetrate deeper than moisturisers into your skin, allowing skin to retain a higher level of moisture. They also contain a high concentration of performance ingredients that really give your skin a boost, both day and night. The Superdrug Vitamin E Moisture Boost Facial Serum has probably been my most repurchased skincare item this year, alongside the Superdrug Hot Cloth Cleanser from the same range. This serum is enriched with Vitamin E; a powerful antioxidant that helps to protect skin from ageing and environmental damage. For me, this serum has the perfect consistency, it absorbs very quickly into the skin and has a lightweight texture, leaving the skin feeling plumped and hydrated. Infused with natural fruit acids, this allows the product to help boost the moisture levels in the skin, and makes the serum suitable to be used both day and night. As well as containing Betaine; which is a great skincare ingredient that helps to smooth and soften the appearance and texture of the skin. Next up, new for 2018 is a skincare range from beauty brand Revolution. I've been using the Revolution Skincare Plumping and Hydrating Serum for just over two months now since the weather has been much colder and my skin has got much drier in areas, and it's definitely been a product my skin has loved. This serum is packed with Hyaluronic Acid, a skincare ingredient that attracts moisture to the skins surface and is the ultimate ingredient for dry and dehydrated skin. This lightweight, oil-free serum sinks in quickly and has a cooling effect on the skin. You can really feel it working! This product has been my winter weather skin saviour, adding much needed hydration into my skin, that leaves it looking plump and feeling silky soft. Thirdly, the B.Confident Phase 1 Night Serum has become a staple skincare item for my evening routine. Advertised as the 'ultimate beauty sleep', this Night Serum has really helped to keep my skin nourished and hydrated, especially in the recent cold weather. With 12 hour moisturisation, this lightweight serum helps to leave you with a softer, plumper and more replenished complexion, in the morning you wake up with the most glowy and radiant skin. Products in the Phase 1 range are suitable to use in your late 20s to help protect against the first signs of ageing and help to keep/enhance the skins youthful appearance. I've previously featured the Superdrug Vitamin C range on my blog before, but the Superdrug Vitamin C Detox Invigorating Skin Booster Serum is something new that I've tried out, and I am completely obsessed! A serum packed with Vitamin C; a powerful antioxidant and the perfect ingredient to help protect the skin and boost radiance. Enriched with Kakadu Plum; the highest known ‭concentration of Vitamin C of any food on the planet, and Goji Berry; a superfruit known to induce calm, ‭wellbeing and energy. The orangey scent of this skin booster is incredible. Super fresh, fruity and zesty! This serum has really boosted my skins appearance, helping to seriously brighten and revitalise my skin, giving me that healthy, radiant glow! These drugstore serums have really affordable prices, and they all RRP for under £10! What are your current favourite drugstore serums? Have you tried any of the products featured in today's post? If you've seen the latest of my foodie blog posts, you'll already know I've been teaming up with Gousto; a food subscription box service that brings you 30+ recipes a week to choose from to create your very own recipe box, and I've had the chance to create some absolutely delicious meals at home in minutes. 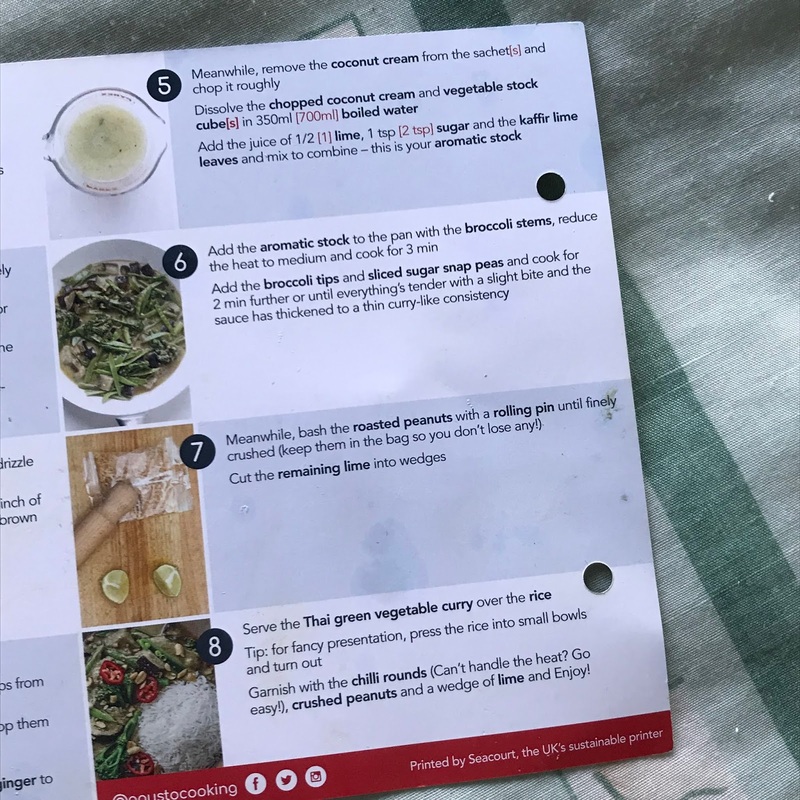 The next recipe that I picked for my recipe box was the Thai Green Vegetable Curry with Lime*. The recipe card as shown below are super easy and quick to follow. 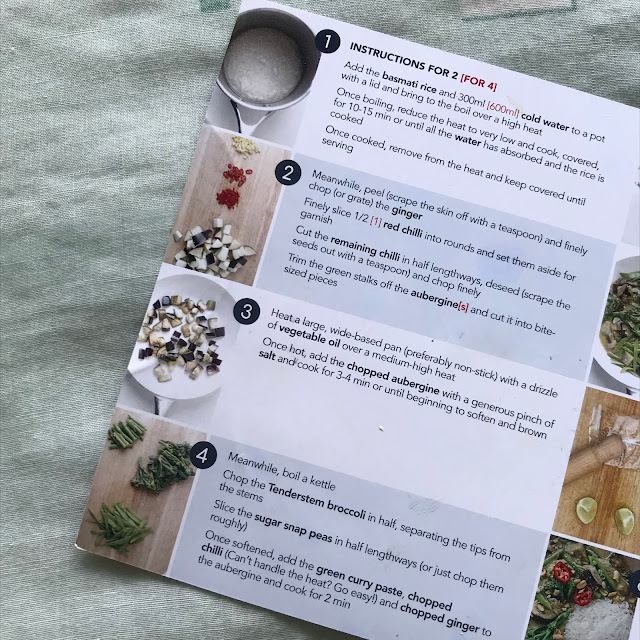 The recipe is broken down into 8 steps, that show you what you need to do and what ingredients you will need for that particular part of the recipe. 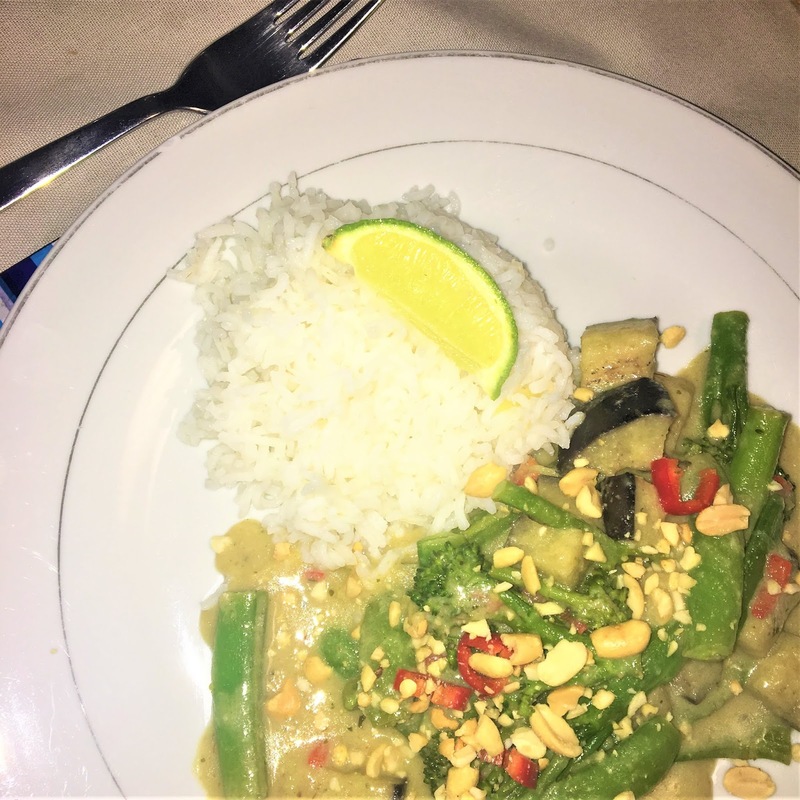 So here's how I made my Thai Green Vegetable Curry with Lime*. Overall, I was pleasantly surprised with this vegetarian dish. Before, I've had only had a Thai Chicken curry previously, and this one is a great alternative and was definitely just as good! A great Asian inspired dish that is bursting with flavours. So zingy with the fresh Lime and a gorgeous coconut green sauce. The flavour combinations were just sensational. Packed full with crisp and crunchy vegetables, topped off with a fiery chilli kick and crunchy crushed peanuts,this Thai curry was absolutely delicious! If you're interested in giving Gousto a go, use the discount code "LTHORNBERRY", this code gives you 50% off your first two boxes! You can use the link to sign up here and get your recipe box delivered asap! If you missed my last recipe posts, I shared a gorgeous Indian-Spiced Chicken Tray Bake with Spinach and some super delicious Refried Bean & Corn Quesadillas. Have you used Gousto before? What recipes would you love to try from the site? 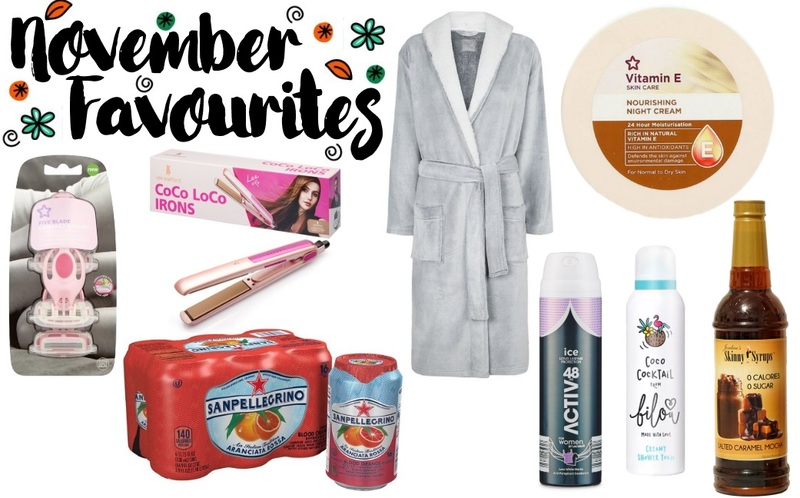 Here are a few of my current favourites this month! A gift I received recently was this super comfortable and gorgeous New Look Pale Grey Hooded Borg Trim Dressing Gown. I already owned to dressing gowns before this one, but this has definitely become my all-time favourite. It's so super soft and cosy, it's been a dream to wear on early mornings and cold evenings. It's hooded, has large pockets, it's lightweight but still soft and fluffy, it's definitely ticked every box for me, and it would make a great gift this Christmas! As I was preparing for my trip to Milan, Italy, I picked up the Superdrug 3 Pack Travel Razors to take with me. Similar to the Venus Snap Razors, these Superdrug ones are such a great alternative, at a much more affordable price. To use, they are so smooth and glide so easily across skin, I've not had one cut since using these. I have slightly sensitive skin and found these worked a treat. The only issue is that they don't last as long as other razors I have use previously, but at only £4 for a pack of 3, I don't mind repurchasing every so often! After my previous hair straighteners decided to die on me, I recently purchased the Lee Stafford Coco Loco Straightening Irons. What drew me towards these ones were how amazing they would be at protecting my hair. Made with ceramic plates that are infused with coconut oil, this helps to keep hair looking sleek, smooth, and shiny. With a super fast heat up time of just 60 seconds and a variable heat control, you'll create your perfect hair style in minutes. Did I mention how super cute the pink colour was also?! Since using these over the last month or so, I have noticed such a difference in the appearance and texture of my hair, it definitely looks and feels a lot healthier. My recent trip to Italy had me falling in love with blood orange/red orange juice. Seeing as it's so hard to find in the UK, I had to fulfil my cravings with the next best thing I could find - SAN PELLEGRINO Aranciata Rosso. A lightly carbonated drink that is super refreshing. The flavours starts off on a sweet note and ends with the invigorating taste of fresh and zesty juicy squeezed oranges. Simply delicious! The Superdrug Vitamin E Night Cream is a new skincare product I have recently picked up, as I needed a new nighttime moisturiser to add into my routine. Since the weathers taken a really cold turn, I wanted to much thicker, and heavier night cream that will prevent my skin becoming dry and dehydrated. The cream itself is very light on the skin, and absorbs very quickly, leaving the skin looking glowy and plump from the very first application. 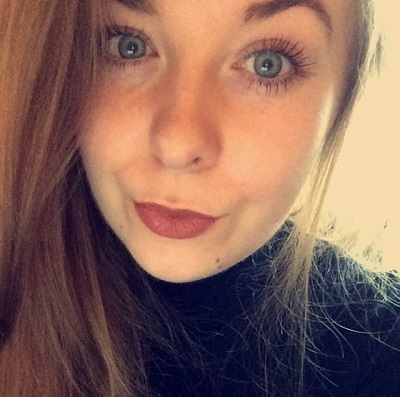 My skin feels instantly moisturised,refreshed and hydrated, without feeling greasy at all. With a price tag of just £2.99, it is a super affordable skincare product and definitely something I would recommend to others who are on a budget or love to try new skincare. A recent find in my local TK MAXX has been the Jordan's Salted Caramel Mocha Skinny Syrup. As a coffee lover, this has definitely added that something special to my morning coffee. This Salty Caramel Mocha Syrup is 0 calories, sugar free and has a deliciously rich flavour. I'm obsessed! I'm definitely going to be on the lookout for new flavours, as I only paid £3.99 for this. What a bargain! Bilou Coco Cocktail Creamy Shower Foam smells just like a tropical paradise, and makes me reminisce about Summer. I used something similar to this when I was in Zakynthos, so when I use this Shower Foam now, it brings back all the memories of my Greek Getaway! Combined with notes of creamy Coconut and and sweet Vanilla, and enriched with Aloe Vera, Almond and Avocado oils, this has been my go-to shower scent for the last few weeks. Once applied, this feels so silky and super moisturising on my skin, it's a perfect product for the Winter months. Something new I've tried this month is the ALDI Womens Lacura Ice Anti-Perspirant. Deodorant is something I always forget to buy, so when I was in my local ALDI store picking up some groceries, I've decided stocked up on this product. At just 69p a can, this deodorant performs just as well, if not better than some of the more well-known, leading brands. For me, I've not seen any faults with this product at all. With 48-hour protection, it's long lasting and definitely keeps you smelling fresh and clean all day long. What are your favourite things for this month? Have you tried anything I featured in today's blog post? With Christmas only a few weeks away, I wanted to share some festive treats that I think would make great Christmas presents or stocking fillers for all the family. Especially those with a super sweet tooth who love the combination of chocolate and marzipan, then Niederegger is the perfect gift. It's unusual, it's delicious and it's super festive! Niederegger; the worlds finest marzipan from Lubeck in Germany, founded in 1806 by the master confectioner, Johann Georg Niederegger. Their flavours include the bittersweet classic, milk, Marc de Champagne, orange, apple strudel, caramel brownie, espresso and many many more! "The secret of Niederegger Marzipan lies in a closely guarded secret recipe, handed down over the generations, for the exact mixture of almonds, sugar and a top secret ingredients similar to rose water. Only the highest quality, natural raw ingredients are used in the manufacture of our marzipan. Niederegger is the only premium manufacturer of marzipan still producing its own almond and sugar paste." The Dark Chocolate covered marzipan Santa is the cutest, most festive treat in the Niederegger Christmas Hamper, and for me, the perfect stocking filler for the whole family. Stick'n Go are Chocolate covered Marzipan Sticks that come in a variety of flavours including Amarena Cherry, Walnut, Dark Chocolate and Milk Chocolate. You receive two random flavours that are included in the hamper. In the hamper I received, I was given the Amarena Cherry and Walnut; pure marzipan with a cherry filling / walnut pieces and rum, covered with a generous coating of milk chocolate. The new style Classic Dark Chocolate covered Marzipan Bar, made with pure Niederegger marzipan in the centre, generously enrobed in rich dark chocolate. If the combination of Dark Chocolate and Marzipan is something you love, you'll definitely end up eating the entire 100g bar of this. It's totally addictive! Also included in the hamper is the 2018 Limited Edition Flavour of the Year; Apple Strudel. A delicious Milk Chocolate coated, filled juicy marzipan and fruity apples, refined by a slight hint of cake. This would definitely be one of the tastiest treats in the gift. Finally, the Assorted Mini Marzipan Loaves. A beautiful eight piece assorted box featuring mini marzipan loaves covered in rich Dark Chocolate. Pure Niederegger Marzipan flavoured with Pistachio, Orange, Pineapple and Espresso Coffee. This offers such a variety, that those who love to experiment with flavours would definitely enjoy this. Especially the Chocolate and Orange loaves, a brilliant festive combination. Overall this gorgeous Christmas Hamper from Niederegger is a perfect treat this festive season. It offers such a variety of flavours and types of chocolates, my favourites definitely being the Amarena Cherry and the Pineapple Mini Loaves, something a little bit fruity and exotic, combined with chocolate is a winner with me! Have you tried Niederegger Marzipan before? What item from the Christmas hamper would be your favourite? * PR sample kindly gifted by Chocolates Direct for review purposes. All thoughts are 100% honest. In collaboration with ALDI*, I'm bringing you the second instalment of my trio of recipe posts for my Winter Warmers series. For today's recipe, I'm turning up the heat and bringing you a quick and easy guide to making my Super Spicy & Sizzling Chicken Fajitas. Mexican food is definitely one of my favourites. It's quick and easy to make, super tasty and bursting with tonnes of flavours. I recently posted about some delicious Quesadillas I made, and today I'm sharing another new recipe with you. So let's get started! Step 1 - To begin this Mexican feat, start by slicing the Chicken lengthways into long strips and marinate with the spices from the Fajita Kit and a squeeze of fresh Lime for 20-30 minutes before cooking. I simply marinated the chicken in the package they came in, as this saves on washing up! Step 2 - Slice the Mixed Peppers into thin strips and finely slice the Onion. I like to use all three peppers in my Fajitas, as this add colour and vibrancy to the dish! Step 3 - Heat up some Olive Oil into a frying pan, add the marinated Chicken strips and cook for 6 to 8 minutes, or until the chicken is cooked through. I also like to add a splash of water to help deglaze the pan a little bit and avoid anything sticking to the pan. Step 4 - Once the chicken is cooked, add the sliced Peppers and Onions and cook for a further 3-4 minutes, so the vegetables warm up and keep their crunch. Warm your Tortilla Wraps from the Fajita Kit in the microwave for 45 seconds, until hot. Step 5 - Serve with your Sizzling Fajitas alongside Sour Cream, grated Cheddar Cheese and a mild Tomato Salsa. Wrap up and Enjoy! If you missed the first recipe, it was my gorgeous Spiced Butternut Squash Soup! Do you like Mexican Food? What do you put in your Fajitas? * This post is in collaboration with ALDI who kindly gifted me vouchers to spend in-store.